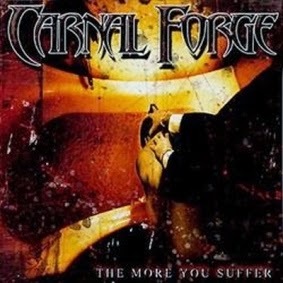 Thanks to the grainy photography, I can't honestly say I have any clue what is happening on the cover of Carnal Forge's fourth full-length album. Someone in a chic suit is drowning or molesting someone else against an oddly shaped bathtub? That's my best guess, but yet again we've got 'artwork' and disposable logo that just don't scream of much effort in engaging the beholder/listener when there are so many more attractive options, even in the psycho/gore metal niche. Anyway, once you ponder over the lyrics it becomes a little more evident that the Swedes focus heavily on violent outbursts, serial killers, and other subjects that seem edgy enough to match the hi octane death/thrashing, as they had since the debut; but it all feels a little redundant and frankly generic in how they structure and package the message. Musically, I felt like the band had slowly made some strides over the course of the first three records, but with The More You Suffer, certain production choices and all-too-familiar songwriting grind that progress to a halt, and it even seems a step backward. It might just be my ears, but after listening through the CD itself I listened to it digitally and on/YouTube to confirm that the mix here just lacks the punch of its predecessor Please...die! Which isn't to say it's a horrible sounding disc, just that it feels like the mids are slightly higher in frequency, and thus everything has perhaps too much of a balance in which I lose the bass earlier against the guitars. Structurally, there's not a broad gap between this and the older material, being largely hyperactive Haunted hustle-thrash which seems like it's racing for a subway train that it's just about to miss whenever the band picks up the pace. The songs are in general longer here, mostly falling between 3-4 minutes which is on average one minute beyond what they're used to, and this extra space doesn't necessarily go to waste. Each tune is enabled with additional versatility, like the moody, overcast cleaner guitars in the bridge of "H.B.F. Suicide", and there are far more melodies and harmonies here than even Please...die! In other words, The More You Suffer seems to be tiptoeing more directly into the Swedish melodeath territory, and while the acuity of the guitars proves they aren't at all bad at this, it becomes even more generic...many of the specific riffs sounds like they're just lifted from the creative stock of At the Gates, Soilwork and Darkane but lacking the character and atmosphere that those acts brought to the field on their career-defining works. The drums are presumably played with the same effort as past albums, and yet I didn't quite feel that their mix was as powerful: the snare seems to pop a lot more while deeper tones blend a little too much into the guitars. Jonas Kjellgren doesn't sound any less angry than on the previous material, and yet I feel like he's reached the bottom of his bag of tricks here, and a lot of the phrasing in lines seems like a mere paraphrase from Firedemon or Please...die! A handful of the songs are engaging for a few spins, particularly those on the latter half of the album ("Into Oblivion", "My Bloody Rampage") which have some tremolo picking passages that help sustain the 'death/thrash' tag, but even there you'll find some pretty boring chord grooves or methodical Swede-o-thrashing 101 which closely mirrors the more mediocre selections of Terror 2000. In the end, while it's as clean as a new razor straight off the assembly line, the production here doesn't captivate me or pummel me in the stomach like the album before it. The songs, while fiery and energetic on the whole, just seem unassuming and bland beyond their pacing. Not awful, but if The More You Suffer never existed, no one would be at a loss...not Century Media, not Carnal Forge, and certainly not you or I.